[PDF] Introduction to Operations Research with Student Access Card | Free eBooks Download - EBOOKEE! 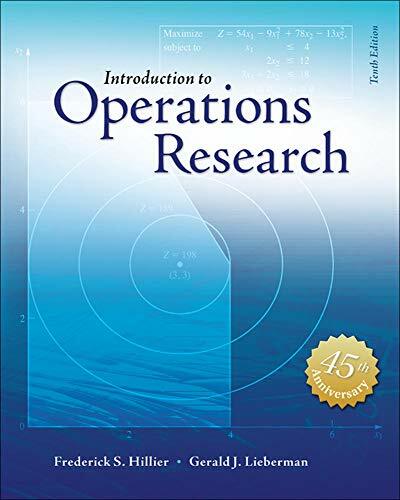 Description: For over four decades, Introduction to Operations Research by Frederick Hillier has been the classic text on operations research. While building on the classic strengths of the text, the author continues to find new ways to make the text current and relevant to students. One way is by incorporating a wealth of state-of-the-art, user-friendly software and more coverage of business applications than ever before. The hallmark features of this edition include new section and chapters, updated problems, clear and comprehensive coverage of fundamentals, an extensive set of interesting problems and cases, and state-of-the-practice operations research software used in conjunction with examples from the text. McGraw-Hill is proud to offer Connect with the tenth edition of Hillier's, Introduction to Operations Research. This innovative and powerful system helps your students learn more efficiently and gives you the ability to customize your homework problems simply and easily. Track individual student performance - by question, assignment, or in relation to the class overall with detailed grade reports. ConnectPlus provides students with all the advantages of Connect, plus 24/7 access to an eBook. Hillier's Introduction to Operations Research, tenth edition, includes the power of McGraw-Hillâ€™s LearnSmart a proven adaptive learning system that helps students learn faster, study more efficiently, and retain more knowledge through a series of adaptive questions. This innovative study tool pinpoints concepts the student does not understand and maps out a personalized plan for success. No comments for "[PDF] Introduction to Operations Research with Student Access Card".